‘Shraddha’… faith in the Almighty, with love and reverence, not necessarily a result of any rational belief or intellectual wisdom, but of a spiritual inspiration. 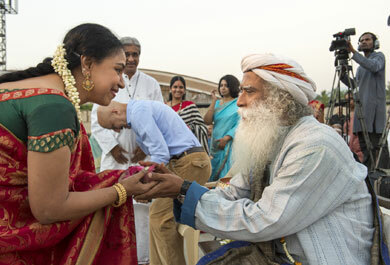 For Sudha, each of her concerts is done with Shraddha. 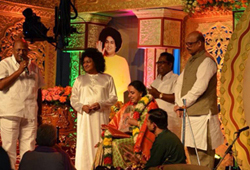 And the profundity of the experience induces a spiritual aura, deepening her faith in the Lord and not losing any opportunity to be amidst those seers and seekers, gurus and god men – those enlightened souls who spread the Lord’s teachings and infuse Bhakti into mankind. 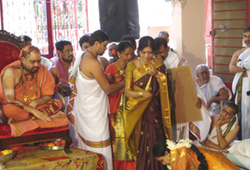 Says Sudha, in a moment of retrospection, “My life has been guided, governed and ruled by the Almighty. I have been graced by His miracles right from the time I toddled into the world. I have many a times been overwhelmed by the infinite graces bestowed upon me and I find it only befitting that I share these revered and precious moments. My very existence today is because of His mercy and benevolence. I would need more than a life time to express my gratitude to Him for this gift of life and music”. 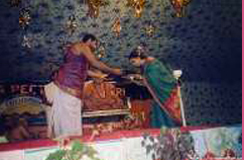 Aasthan Vidhushi of Sri Avani Sringeri Jagadguru Shankaracharya Mahasamsthanam. 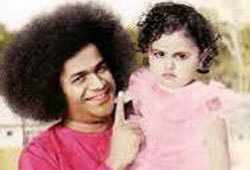 Graced by Bhagavan Shri Sathya Sai Baba, Puttaparthi. 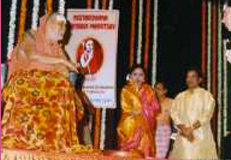 Blessed by Jagadguru Sri Bharati Teertha Mahaswamigal, Sringeri. In the hallowed presence of the Kanchi Mahaswamigal.